"One of the few freehold islands only minutes off the east coast of Australia with tropical vegetation. This imaginative, environmentally friendly retreat was designed by Tone Wheeler for international creative thinking guru, Dr. Edward de Bono. The island house: an award winning, energy efficient simple extruded building with open plan living/conference room, north facing bedroom, polished timber floors, bathroom and kitchen with sea views. Generous eaves, wide balconies. 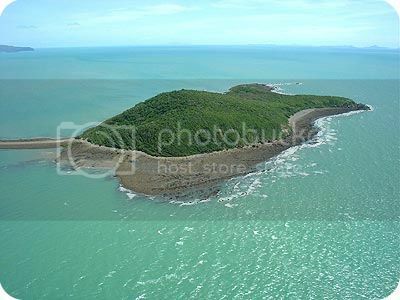 The island is covered with vegetation ranging from tropical palms and dense tropical rainforest to light growth consisting of self sown mangoes and mixed coastal bush. Beautiful sandy beaches encircle the island, forming a sandy spit at one corner. The island has a 70 m peak and a spring fed lagoon. The house is on a small beach facing spectacular mainland views. Filtered rainwater, recycled water for irrigation and solar hot water." E só custa US$ 2,000,000!